Missing teeth can go unnoticed but may reduce confidence regarding appearance, difficulty speaking and a challenge when eating certain foods. Dentures can help to take the place of missing teeth, either as a medium-term measure while children and young people are growing, or as a longer-term measure in adults. Treatment for a child without teeth may be of value. The right care can aid their psychological development through better social and emotional adjustment. The impact can be quite dramatic. Improved aesthetics – dentures will create an age appropriate facial appearance. The child does not have the “old man” appearance resulting from over closure of the jaws. Improved social wellbeing – the child becomes happy and smiles instead of frowning, for the most part they look like their peers. They may become more outgoing. Improved psychological wellbeing – the child may feel better about themselves and as a result will exhibit more self-confidence. Small children affected with an obvious physical deformity, such as the lack of teeth, run the risk of low self-esteem. Improved mastication (chewing) – the child may function better with teeth than without teeth. Improved speech development – speech may be improved resulting in increased communicative skills as well as interpersonal relations. Psychological uplift to the entire family. The transition into wearing dentures comfortably will take time and does not happen overnight. Problems do and will arise. But in most instances, these hurdles can be cleared through a cooperative effort between the child, parents and the dentist. Many dentists may ask “who wants the dentures, the child or the parents?”, the inference of this is that it is the parents. This is a big step for any child and they do need to want dentures in order to wear them. However, as the child has never had a full set of teeth, they don’t know or appreciate the benefits of having dentures. They don’t realise their speech will improve, eating may be easier, and their appearance will improve, which may help avoid nasty remarks. The first dental visit is recommended for all children before their first birthday. 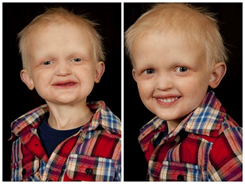 For children with ectodermal dysplasia, early visits are just as important, even if there are very few teeth. If there are many missing teeth, we encourage parents to begin seeing a specialist paediatric dentist at a dental hospital with their child as early as 2 years old to enable the child to get used to the surroundings and build up a rapport with the dental team. The hope is that when treatment begins they will be happy, co-operative and comfortable, although we do appreciate some children take longer to settle in. If possible, it is beneficial to see the same dentist each time to continue building the child’s confidence. It is very important to learn good oral care and practice from the outset. Clean and healthy natural teeth will make better foundations for dentures. Preventive advice is given by trained dentists from the first year of life onwards and will include advice around cleaning teeth, diet and habits such as thumb and soother sucking. From our experience we have found some children just don’t want dentures until they are in their teens, and this is fine if they are happy and confident – it is important to remember every child is different. The number of missing teeth will determine whether dentures should be complete (full) or partial, where some natural teeth are present in the mouth. Complete Dentures: These are made of a plastic base that is gum coloured in order to replicate the natural tissue (gum) on which a full set of plastic teeth are placed. The upper denture covers the palate (roof of the mouth) and gums, while the lower denture is shaped like a horseshoe to allow space for the tongue. Traditional complete dentures are held in the mouth by forming a seal with the gums. Partial Dentures: These fill the gaps where teeth are missing using gum coloured plastic incorporating artificial teeth. The base of the denture may be either plastic or metal. Both have their advantages and disadvantages, although plastic is usually preferable for shorter term use or where temporary adjustments need to be made. A partial denture with a metal base may be preferred once the adult dentition has erupted and no further changes in tooth positions are planned. Both types of denture may have metal clasps which clip around some of the natural teeth to help keep the denture in place. It is important to recognise that successful denture use requires the development of new oral skills and that the patient therefore needs a period of adjustment for the best outcomes. Overdentures are used if there are only a few natural teeth. These fit over the underlying natural teeth, and both they and the overdentures and the denture must be kept very clean to avoid gum disease and dental decay. They can however be very successful in restoring function and appearance where there are few natural teeth, especially if they have not fully erupted. This is called infra-occlusion and is common in individuals with hypodontia. Please see Teeth Tips for more information relating to dentures. The process of having dentures starts by taking a series of impressions or moulds of the oral tissues (the gums and roof of the mouth) that will support the denture. The dentist will use a dental impression tray. These are pre-made in a range of sizes, and the dentist will use the size that best fits the patient’s mouth. If this is not possible then a special tray will be made. The tray will be filled with a soft impression material (usually alginate) and placed in the mouth. After a few minutes the impression material sets to become an elastic solid. This is then taken out of the mouth leaving an imprint of the teeth, gums and roof of the mouth. The impressions are given to the dental technician, who casts plaster models from the impressions. These are called the primary models and are used to construct individual impression trays for the patient. Secondary impressions are then taken with these using an elastic material, and these are sent to the technician who makes master models of the mouth. Before the dentures can be made, bite registration blocks are first constructed. These are designed to allow the dentist to record how your teeth bite together as everyone is unique. They are made primarily of wax and are used as a guide for arranging the teeth. The registration blocks are placed in the patient’s mouth and the dentist adjusts them for height (recording where the upper and lower teeth will meet), and contour so that they mimic as closely as possible the patient’s missing teeth and gums. The blocks are returned to the technician. The models and registration blocks are mounted onto an articulator: a device that mimics the patient’s jaw movements. The dentist and laboratory technician will then slowly start building the dentures on the models and transferring the dentures to the patient’s mouth at each step to ensure proper fit, establish a proper bite, and ensure that the appearance and aesthetics of the denture are desirable. Pre-made plastic (acrylic) teeth are placed into the blocks, keeping everything aligned within the boundaries defined by the dentist during registration. The upper anterior teeth are usually placed first, followed by the lower and posterior (back) teeth. Denture teeth are placed in such a way that there is usually always a bilateral (each side) contact between the upper and lower denture, to stop them tipping during talking and chewing. This is called balanced occlusion and is different to what is normally found naturally. The denture is waxed up, using pink wax to make the soft tissue areas mirror as closely as possible natural gums. The dentures are returned to the dentist at this point for a wax try-in, where they are checked for fit, function and aesthetics. Any changes required are relatively simple to do as the denture is made from soft wax. As we often don’t have naturally perfect straight teeth it may be desirable to ask the dentist to have the teeth placed on the denture base which are slightly askew, especially for children. The patient will generally need to be seen by the dentist once per week for about 4 to 5 appointments until the denture is complete. The patient will then need to return occasionally during the first month (up to 3 times as an average) after the denture is fitted to have adjustments made. Where possible we hope that a denture can be worn without using fixatives of any type. Sometimes, however, where the ridge supporting the denture is very flat, some fixative may be helpful. Dentures can restore or even enhance a person’s appearance and be virtually unnoticeable. It takes some time to find the best way to insert and take out the dentures, and the gums will be a little sore in places at first. It is very important to return to the dentist often during the first few weeks to adjust the parts of the denture that are irritating the oral tissues (tongue/gums). Your local dentist can make these adjustments. Eating with the dentures in place requires some practice. It is best to start with soft foods, chewing food equally on both sides of the mouth and slowly introducing more solid foods. Chewy or sticky foods should initially be avoided. Once the cheeks and tongue get used to the denture, they will begin to automatically help to keep the denture in place. Speaking requires practice but will become easier with repetition. With exaggerated movements such as yawning or laughing, the denture may become dislodged at first. The denture may cause an increased production of saliva at first, but it will reduce back to normal. Are dentures worn throughout the day? Dentures are generally worn during the day and taken out at night to give the oral tissues (gums) time to relax. During the first few days after receiving the dentures, they may need to remain in the mouth even when sleeping to best identify areas that need to be adjusted. Denture adhesive is a paste or glue that helps the denture adhere to the supporting tissues instead of relying on suction or clasps. Sometimes the adhesive is called denture cream. A small amount of denture adhesive can be applied evenly to the clean surface of a denture to enhance stability and retention. It shouldn’t be used to compensate for a poor-fitting dentures or as an alternative to visiting the dentist for regular check-ups. This is dependent on how fast the child is growing, but usually 2/3 years and for adults 5 years or more. Over time, the bone can change and the denture becomes loose. The rate that this happens varies with each individual but can be controlled by visiting a dentist regularly to ensure that the dentures are fitting properly. An ill-fitting denture can traumatise the soft tissues in the mouth. To prolong the life of a denture, a dentist will often use a denture liner to refit the internal surface of the denture to the oral tissues. Minor fractures in the teeth or acrylic base can usually be repaired by a dental laboratory in 1 to 2 days. Denture repair kits are even sold at most chemists and online to fix minor cracks or replace loose teeth. The use of these is better avoided as repairing a denture properly can be complicated, and errors may be difficult to correct. If denture problems are noticed, it is best to contact a general dentist as soon as possible to arrange for denture repair. Regardless of what kind of dentures you may have, all need to be cleaned daily, just like regular teeth. Even though dentures are made up of artificial teeth, bacteria, plaque, and tartar still build up on them and can harm existing teeth and gums. Half fill the sink with cold water before attempting to clean the dentures. This will break the fall, should you drop them, and prevent damage. Dentures must be handled with great care and placed in a container of water or denture cleaner when not being worn. They should never be placed in hot water, as they can be damaged or warped. To clean your dentures, take them out of your mouth and run clean water over them to dislodge any food particles that may be stuck between teeth, along the gum line, or underneath the structure. Then brush the dentures all over with a denture brush or soft toothbrush using a mild soap or denture cleaner (NOT toothpaste). Be sure not to use any other cleaners i.e. regular toothpaste or electric toothbrushes as these are all too abrasive and can damage or wear away the denture materials. After cleaning, make sure to rinse them well. While your dentures are out of your child’s mouth, be sure to clean their gums and any natural teeth with a medium wet toothbrush with fluoridated toothpaste. There are a lot of different denture products that can be purchased at any chemist to help with caring for and cleaning dentures.